Those people, who achieve Entire Faqar, they become Laa-Yuhtaaj against the world and all that it contains. Moreover, those, whose gaze becomes Kimiya-gaze, why would they waste their time in making Kushta? In addition, those Seekers, whose Mentors are present with them all the time, they do not receive blows and injury from their enemies. 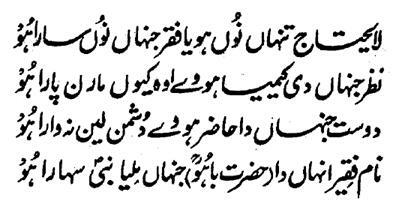 At the end, he says that 'real Faqeers are those, who get the honor of seeing the Holy Prophet Sal Allahu Alaihe Wa Aa-lehee Wa-sallam and his Hazoori.